Jesus began his preaching and healing ministry by being baptised in the River Jordan. The vast majority of followers over the two thousand years since then have begun their Christian lives with baptism. 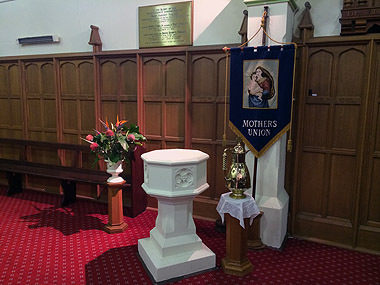 In the Anglican church, many people are baptised when they are babies; however, when people convert to Christianity as adults, they can receive an adult baptism. It is a “once and for all” sacrament, it cannot be redone or undone. At baptism, the symbols of water (cleansing), oil (setting apart) and the candle (to shine as a light in the world) are used. Baptisms take place during worship at St Michael’s 10:00am Sunday service or outside worship in exceptional circumstances. A godparent is someone who, with the parents, makes promises to support and encourage the person being baptised in the Christian faith. The godparent, along with the parents of a baby or child, also makes promises on behalf of their Godchild. What promises do godparents make? The godparent promises on behalf of the godchild to turn to Christ, to repent of their sins, to reject all that is false and unjust and renounce evil. There must be at least one godparent or sponsor. Three or four is the usual number. Can I be baptised with my child? Yes. Baptism of adults normally also includes confirmation. Please speak with Fr David about this. Is there a special requirement to be a godparent? Godparents must be baptised. If you would like to ask someone who is not baptised to be a godparent, please talk with the priest about this. If you would like to make enquiries about baptism, please contact Fr David.